Sweet Corn Coconut Chowder with a Thai twist! 1. Heat olive oil in a large pot over a medium-high heat. Add onion and garlic and cook stirring for 5 minutes or until starting to brown. 2. Add stock and potatoes, bring to a simmer, cover and cook about 15 minutes or until potato is soft and cooked through. 3. 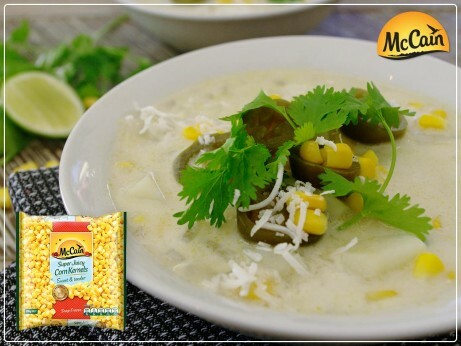 Add frozen McCain Super Juicy Corn Kernels and coconut milk, return to a simmer and cook uncovered for 5 minutes. Add lime juice and season with salt and pepper to taste. 4. Evenly ladle soup into bowl and top with optional fresh coriander, coconut flakes and pickled jalapeños. 1 Heat olive oil in a large pot over a medium-high heat. Add onion and garlic and cook stirring for 5 minutes or until starting to brown. 2 Add stock and potatoes, bring to a simmer, cover and cook about 15 minutes or until potato is soft and cooked through. 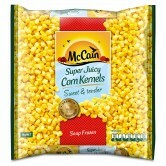 3 Add frozen McCain Super Juicy Corn Kernels and coconut milk, return to a simmer and cook uncovered for 5 minutes. Add lime juice and season with salt and pepper to taste. 4 Evenly ladle soup into bowl and top with optional fresh coriander, coconut flakes and pickled jalapeños.